Have you run out of space for visiting guests? Or maybe you’re looking for a weekend getaway. Why not consider the Capes Escape vacation rental? 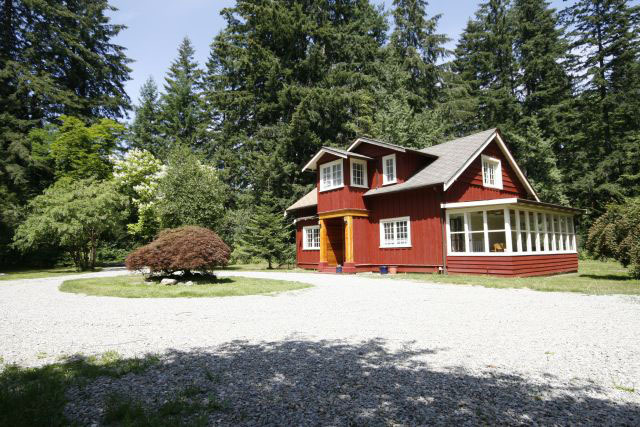 Located just minutes from downtown Courtenay, the Capes Escape is a beautiful and affordable rental alternative. Fees for your stay at Capes Escape go directly to improving this important site and to ongoing Courtenay and District Museum programmes. Capes Escape, the museum’s vacation rental property, continues to do great business. 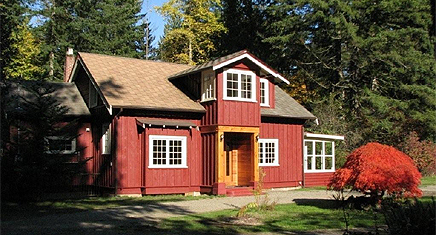 The home, situated on seven acres of forested land on Cumberland Road, was donated to the museum by the late Katherine Capes. Located approximately 4 km from Highway 19, Capes Escape is only minutes from downtown Courtenay and Cumberland. If you’ve got company coming for a visit and are looking for a comfortable and convenient rental space, consider Capes Escape. The Raising the Capes Roof crowdfunding is moving along quickly thanks to generous donors who have taken the amount from $20 to over $1,800 in the last month. The museum aims to raise $5,000 towards a new roof and will match this amount with other fundraising dollars. Katherine Capes donated the historic Capes home to the museum in the late 1990s Thank you to everyone for your ongoing and generous support! The Courtenay Museum has started a crowdfunding campaign to raise the roof at Capes Escape. We’re aiming for a fall redo of the roof of this great historic home and have teamed up with FundRazr and InvestLocalBC to crowdfund some matching dollars. In the 1990s, Katherine Capes, one of the first female archaeologists in Canada and a founder of our fifty-five-year-old society, donated her home and seven acres as a legacy in perpetuity to the museum. Everything is in great shape on the house–except the roof! The estimates we’ve received take us to a total of $10,000. We’re asking donors to help us with half that amount. Your donation, no matter the amount, will help us preserve this wonderful heritage home. For donations of $50 or more, we will provide you with a gift of the Marilyn Timms print of the Capes property “West Coast Retreat”. Thank You, Merci, Obrigada, Arigato! Capes Escape: All Spruced Up! Workers have just completed a mini-reno/up-date on the Capes Escape vacation rental property and the place is looking great! October is Women’s History month in Canada and this year’s theme is Strong Girls, Strong Canada: Leader’s From the Start. Here’s an interesting related story about the Capes sisters – two young women who were way ahead of their time. Katherine and Phyllis Capes sure made the front page headlines in the Toronto Daily Star newspaper back in August of 1933. With $8 between them and 30 pound packs on their backs, they hitch hiked their way across the country. In total, they had 28 traveling days. They slept most nights in their sleeping bags in or outside any type of building. On average, they only walked up to five miles a day; the rest of the time they hitched car rides or rode the freight rails. 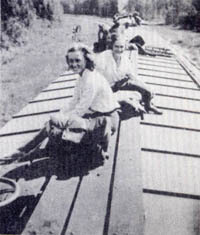 They started their adventure by hitching rides up to and through the Crow’s Nest Pass and then learned how to ride the freight trains from Kenora onwards. With help from motorists, trainmen and hobos, the Capes sisters made their way across the country, quite an adventure for two teenage sisters back in the 1930s.